The Optimus Brazilian Jiu-Jitsu Academy, Orange County’s #1 source for BJJ, is is owned and operated by Professor Grant Collins in Laguna Niguel, California. Professor Collins has dedicated his life to marital art training for 25 years. He holds a second degree black belt in Tae Kwon Do, a first degree black belt in Hapkido, and a second degree Black Belt in Brazilian Jiu-Jitsu under Mauricio “Tinguinha” Mariano. Professor Collins has more than 14 years of teaching experience, creating stronger people through martial arts. Grant began his combat training early when his parents placed him in wrestling at the age of 7. He wrestled for 7 years competing and winning several tournaments. At the age of 16 he began training Tae Kwon Do, achieving his 2nd degree black belt by the age of 24. Being a fierce competitor Grant dominated the local full-contact tournaments, winning over 20 titles. Because of his performance in local tournaments he was invited to train at the U.S. Olympic Training Center (OTC) in Colorado Springs two years in a row. During his training at the OTC he perfected techniques and drills that enhance explosive power and devastating striking skills. In 1998, Grant began his martial art career as head instructor at the Tae Kwon Do Institute (TKDI) in Santa Fe, NM where for 4 years he honed his teaching skills by instructing up to 300 students per week. During his instruction, Collins observed the positive change martial arts training had on all the students, young and old. He saw the weak become strong, the timid become confident and the lazy become disciplined. After putting his teaching on hold at the TKDI, Grant heard about a talented Brazilian Jiu-Jitsu (BJJ ) fighter, Alberto Crane, who was teaching classes nearby. Collins, who was very interested in this school, signed up and began his Brazilian Jiu-Jitsu training. 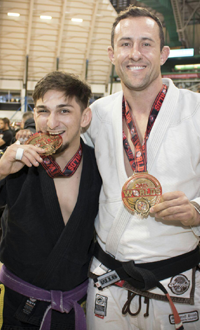 Prior to training, Grant already had an ongoing interest in BJJ especially after he watched Royce Gracie (BJJ fighter) dominate at the early Ultimate Fighting Championships (UFC) where he used BJJ to submit his large opponents. Needless to say, Collins had a wake-up call after his first experience on the BJJ mat. He was amazed and shocked at how easily the beginner white belts could take him down and submit him. His 10+ years of training was no match for guys who had trained 6 months at the Brazilian Jiu-Jitsu academy. Being a true student of the martial arts he soon quit his job as head instructor at the Tae Kwon Do school, put his 2nd degree black belt on the shelf, and began his journey to learn the most effective martial art in the world, Brazilian Jiu-Jitsu. After training Brazilian Jiu-Jitsu over 17 years and winning over 25 titles, including Silver and Bronze at Pan American Games, and Gold at the SJJIF World Championships, Grant opened his own school, the Optimus Brazilian Jiu-Jitsu Academy, which is central to Dana Point, Aliso Viejo, San Clemente, Laguna Niguel and Laguna Beach. Each day, he dedicates himself to building a strong Brazilian Jiu-Jitsu academy with a community of disciplined, energized students.